Mark E. Elliott is an artist and craftsman specializing in the re-creation of flintlock sporting arms and accouterments, with a particular interest in southern (Virginia) longrifles, shot pouches, and powder horns. While it is easier to refer to him as a gunmaker, he is more than that. Mark has interests in all sorts of arts and crafts including fraktur (18th- and 19th-Century German folk art), calligraphy, period cabinet making and joinery, wood turning, and photography as well as drawing and painting. He brings all of that to bear on his firearms and accouterments work. As much as Elliott considers himself an artist and craftsman, he made his living mostly in information technologies with more than 23 years’ experience in IT operations. He also taught technology to high school and college students, and started his working life as a detailer/draftsman making custom furniture and fixtures. Very early, however, Elliott fell in love with antique firearms, particularly the American longrifle. He was captivated by the artistry and craftsmanship of these guns. The variety of skills required to create one appealed to him, as well as its integral part in the history of our nation. Consequently, he has spent a good bit of his spare time (what little there was of it) over the last 30 some odd years learning to build the American longrifle and its accouterments. Elliott started his gun building career with a CVA pistol kit he received for Christmas when he was in the seventh grade. When Mark was in high school and college, he completed a longrifle from a curly maple stock blank with a Douglas swamped barrel and a Doc Haddaway lock. By his own admission, it was a pretty awful mishmash of longrifle styles with some really bad carving. Fortunately, he has learned a lot since then, and the parts have long since been recycled from that first rifle. Due to the demands of a burgeoning career in information systems, Elliott didn’t start another rifle for 15 years. Eventually, tired of working with computers day in and day out, he started working on his second rifle in 1995. It was an iron-mounted, southern-style longrifle, made using a Green Mountain barrel, a small Siler lock that he made to look like a late flint period English lock, and a very plain piece of black walnut from his father’s wood rack (the last large piece of a walnut tree cut from the mountains of Virginia decades before). That longrifle won a Judges’ Choice award in the Apprentice class at Dixon’s Gunmakers Fair in 1999 and provided the encouragement for him to keep building. Elliott has been studying and building seriously since 2003 and won a First Place ribbon for craftsmanship in the Journeyman class at Dixon’s in 2005, and another Judges’ Choice ribbon in the Master class in 2009. As well as being a regular attendee at Dixon’s Gunmakers Fair, Elliott has also attended the Armsmakers Workshop at Conner Prairie, and the N.M.L.R.A. Gunsmithing Workshop in Bowling Green, Kentucky. He also takes every opportunity to study original longrifles and accouterments, making appointments as necessary to view both public and private collections. Elliott has a particular fondness for southern longrifles and accouterments, particularly the longrifles made in the region from Augusta County, Virginia, southwest into East Tennessee. He is currently concentrating on building and collecting longrifles and accouterments from that area as well as painted furniture and fraktur from up and down the Valley of Virginia. While his particular interest is southern longrifles and accouterments, he welcomes any longrifle, fowler, or pistol project. His current projects are listed on his website. The planned projects are in, you guessed it, “Planned Projects.” As he is always making something new to strike his fancy, the previous items need to find a good home. Nothing Elliott makes is his forever; just until he make something he likes better or somebody else wants it more. If you are interested in anything he has up for sale, is planning to make, or made in the past; he would love to hear from you. With regard to the recreation of traditional longrifles, accouterments, and fraktur, Elliott bases his work on original guns, pouches, powder horns, and fraktur without trying to make an exact copy of any particular item. He tries to imagine himself in the place of a particular 18th- or 19th-Century tradesman and build a gun, pouch, horn, or fraktur document that he or she might have created. He feels that there should always be something of himself in everything that he makes, consistent with the stylistic elements of the maker, shop, or region that he is trying to re-create. In an effort to put himself in the shoes of the original gunsmith, horner, harness maker, or artist, he uses as many period tools and techniques as is practical. While he does use some power tools for the initial roughing out of gun stocks, he still use planes, chisels, scrapers, rasps, and files as his primary instruments in the creation of a longrifle. Many of the same hand tools are used in the making of horns, but he does use a lathe for turning tips, bands and base plugs. The leather work is done entirely with period hand tools, materials, and finishes. All the fitting and finishing work in his cabinetry is done with period tools and techniques. The fraktur is done with the same type dip pens, brushes, and watercolors used by the original artists on fine-grade calligraphy or watercolor paper. Most of his wood and metal finishing is done in the 18th-Century manner using fine files and scrapers with very limited use of sandpaper and steel wool. This results in a somewhat rougher finish complete with tool marks consistent with the finish of the original products. That way, you get both the look and feel of the original item. His guns start from a stock blank, he hand inlets the barrels, and he hand forges all of his iron mounts. All the work is done in the manner of an 18th-Century workman as much as is possible. This means getting the job done in the quickest and most efficient manner possible, spending time only in those areas likely to be seen by the customer and to a level of finish expected by an 18th-Century customer. 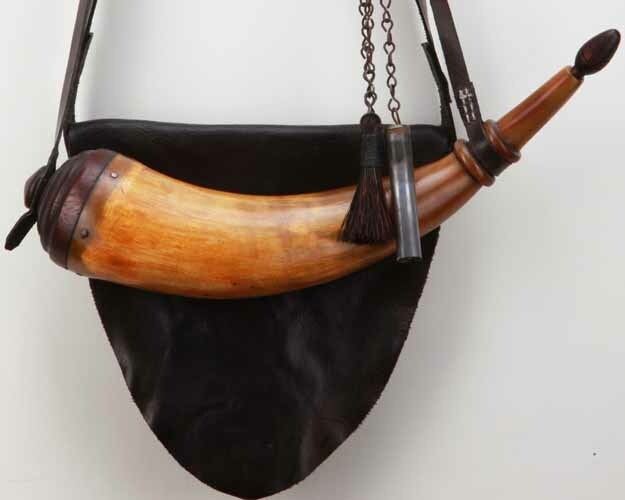 As the longrifles, shot pouches, and powder horns he re-creates were made before the industrial revolution when everything was handmade, the expectation of the customer in terms of fit and finish was much lower than a 21-Century customer who is accustomed to products being absolutely identical and perfect in every way. Elliott’s goal is to produce a functional gun, pouch, horn, or fraktur of superior quality that looks like it came out of an 18th- or early-19th-Century shop. That means that he doesn’t try to produce an item that is highly refined, highly polished, and blemish free. That would not be representative of most early American work. A gun stock or powder horn will have a scraped surface with occasional tool marks, blemishes, and in the case of a gun or pouch, a satin oil finish. Iron or steel parts will be polished and/or heat or charcoal blued as they were in the 18th Century and may have a patina added to simulate a few years of gentle use. Similarly, brass and silver will be polished to a satin finish and then aged with a light patina. Leather and paper goods will show some signs of wear or age. Nothing should look like it just came off a modern assembly line, shiny and new.